Goodwell, located in the heart of historic No Man's Land, officially became a town on June 16, 1903, when the post office was established. The Rock Island railroad was responsible for creating Goodwell along with many other communities along the railroad. Goodwell was named by railroad workers who were fond of the good soft water which came from the well they had drilled on the town site. Goodwell was later incorporated on January 2, 1917. Good water is not the only reason Goodwell receives recognition. 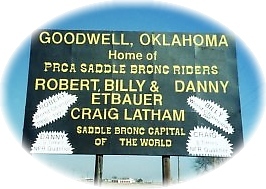 Goodwell, Saddle Bronc Capital of the World, is home for four Professional Rodeo Cowboy Association (PRCA) world-ranked cowboys. OPSU Rodeo Team (3-time National Collegiate Champions).